Direct from Playset Magazine’s World Headquarters, May 26th: Easily one of the most requested non-combat playsets ever is a wish fulfilled for Playset Magazines eager readers. Once again we have dug deep to give you exclusive coverage of these highly loved playsets based on those beloved, hit television TV shows of the early 50’s. Super Circus featuring Ringmaster Claude Kirchner and beautiful Mary Hartline, and the Big Top Circus’ Jack Sterling. Both of these sets – Big Top Circus and Super Circus -- were early competitors of one another, exclusives at their respective Wards and Sears catalog retailers, and you’ll learn which came from where. And we include the actual newly discovered documents (from the personal archives of Louis Marx & Company and Louis Marx himself) that turn notions of which set came first right on their head. Who else is going to publish this for you? No one! And this issue is profusely illustrated with every accessory, animal, monkey and performer in these big Marx playsets based on the circus phenomenon. We’ll examine them in great detail with a loving interest in the variations and add in a colorful center spread. We also made room in this edition for some terrific Circus sets like Tim-Mee and its fabulous space age clowns, Ideals Circus set, and many more. So thorough is this coverage that our masthead list of contributors is very long, headed by fresh new contributor experts Ed Sponzilli, photographer contributors Ed Berg and Terry Rogers, plus the fabulous Kent Sprecher and many others. There’s reviews, news, special \ features and nostalgic fun galore for collectors and casual readers alike this issue so join us for a Summer playtime bash with some terrific new accessories and colorful animals on view! And we want to send special thanks once again to the finest webmaster this or any side of the great Mississippi River, Mr. Jim Clouse for proving this excellent digital domain services to bring you this announcement. Thanks Jim! 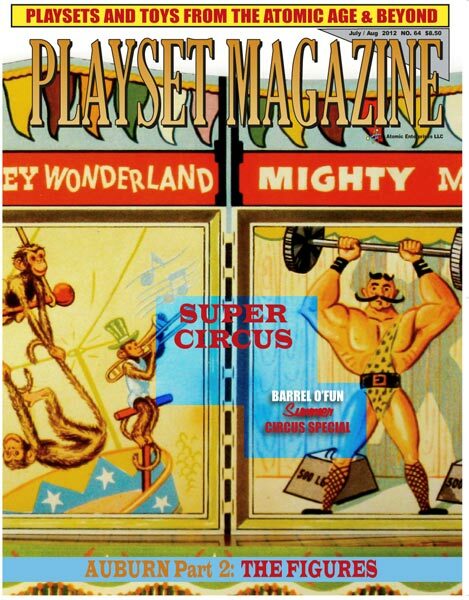 So let’s run away to the circus this summer, if only on your couch on the pages of America’s foremost vintage plastic toy publication – playset and vintage plastic magazine, Playset Magazine: A terrific source of this specialized information.